Round about March it started getting beastly hot in Yuma. We toughed it out for a couple more weeks, and finally left for higher elevations in April. Here is a view from my front yard in the National Forest on AZ 288 north of Miami. You can see Lake Roosevelt in the distance. Here is most of my menagerie going for a walk. The cats follow me around meowing like lunatics. We spent the heart of winter in Yuma (we found FREE camping there...huzzah! ), where there is a little bubble of good weather in the winter time. I had the summer I yearned for (the real summer was destroyed by choking clouds of smoke from forest fires) in December and January, as it was in the 70's and low 80's. 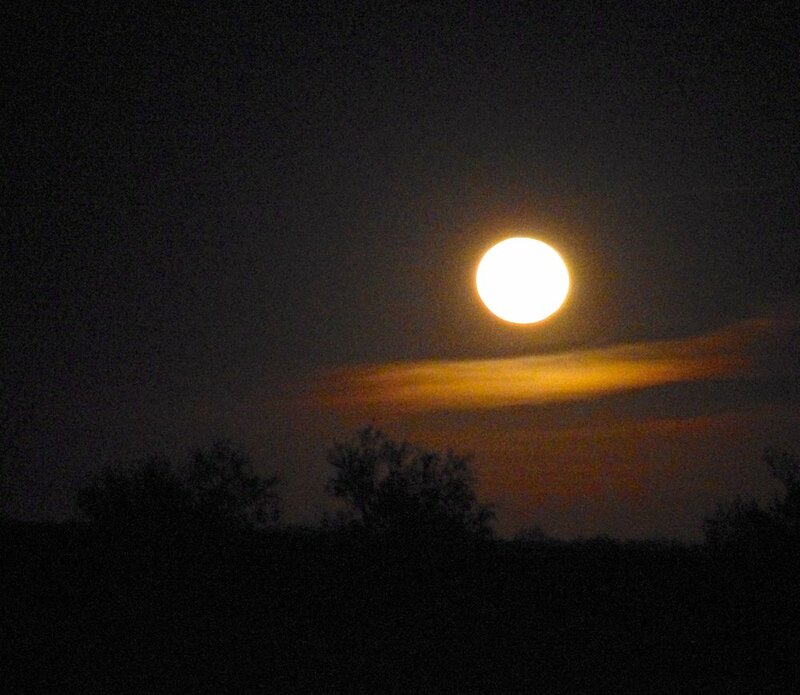 While there, we observed the blue moon rising over the desert. I know this isn't a great photo, but the size of the moon was breathtaking and I had to include it. Oops...I forgot to mention that when we were traveling south from Grand Staircase we went through the Vermillion Cliffs National Monument. Here is an example of why they call it 'Vermillion'. 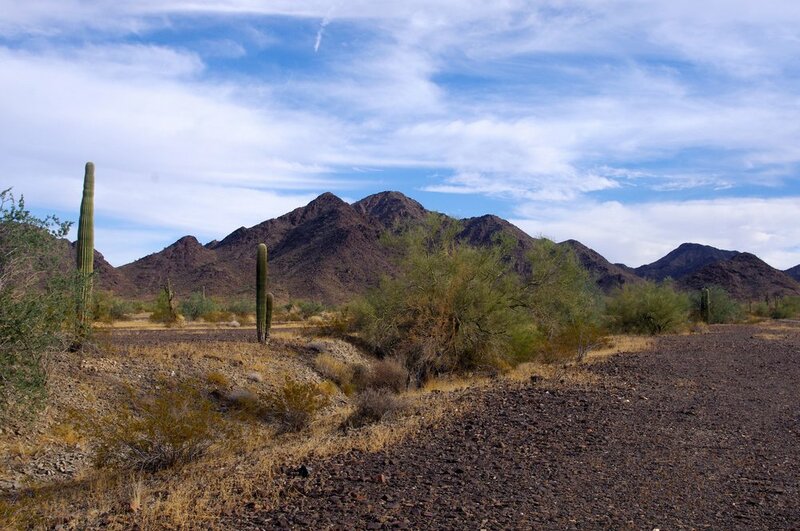 From E/GS NM, we went to Quartzsite and stayed in the KOFA National Wildlife Refuge. The landscape there is typical of the mountain/desert terrain: lots of saguaro and cholla cacti (although there are no cholla in this picture...I was afraid to photograph them for fear they would leap out and grab me), and lots of dry shrubs. Everything has thorns in the desert, even the trees. Shadow got cactus spines all over his nose and inside his mouth, and I had to drug him in order to pull them out. Instead of learning from this mistake, he went out and did it twice more. And here is one of the places we passed whilst triking. Same as last year, I was unable to watch the Super Bowel, so I once again watched Imaginary Football instead. I couldn’t post the results on Super Bowel Sunday because the game was the longest game in the history of sports…12 hours, to be exact, and I was exhausted by the time it ended. In fact, I didn't even realize the game was over until hours later, as I fell asleep somewhere around the tenth hour. This year’s contest pitted the Cleveland Chain Gang against the Denver Dinosaurs. Unlike last year, which was at least a gripping drama of defensive maneuvering worthy of the history books, this year could aptly be named the “Stupor Bowl”. The Chain Gang couldn’t seem to function as individuals…everywhere you looked, they were all clumped together on the field, tripping over each other (as well as the Dinosaurs). They tried to explain it away as a “zone offense”, but whatever they called it, it wasn’t very effective. The Dinosaurs, on the other hand, were so lethargic as to seem half-petrified. Their movements were painfully slow. In fact, it appeared throughout much of the game that they actually were not moving at all. They also had trouble organizing their plays, apparently due to small brain size. It’s hard to imagine how these two teams won the play-offs, and I didn’t try. One imaginary game was about all I could handle. I think the contest would have lasted another 12 hours, but the Dinosaurs, due to old age, finally fell asleep and the Chain Gang was able to hobble into the end zone en masse to end the game in not-so-sudden death with a score of 6-0 Chain Gang. I watched the last two hours on Monday evening using imaginary fast-forward because I couldn’t bear another two hours of agony. The crowd (except me…I fell asleep on a bench) had all abandoned the game in about the fourth hour, so there was no one left to cheer for the winners. I felt bad about that. I was rooting for the Dinosaurs, anyway. After a few highly productive days in the Uinta NF, we came south on UT 36 until we reached US 50, then headed west on US 50. 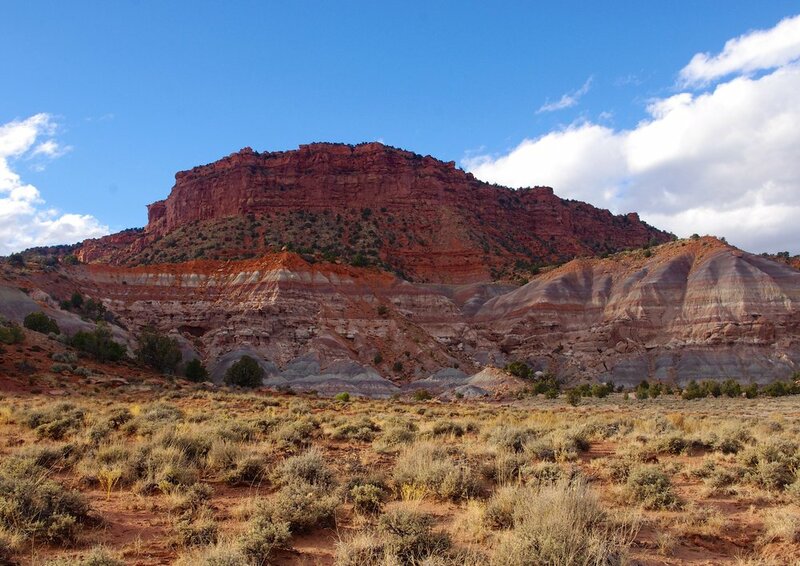 There are vast miles of seemingly useless land in western UT, and it turns out that much of it is owned by the Bureau of Land Management. That is just peachy with me. I love BLM land. You can camp anywhere you can drive, basically, for 14 days for $0. That is a price I can afford on my new, post-career budget of ....well, nothing. We also found a place in Delta, UT, to perform regular sewage management functions (i.e., dump our waste tanks) for FREEEEE!!!!!!!! What could be better? From the highway, about midway between Delta and Nevada, you can see vast, flat, white areas that look like water until you get close to them. Then they stop looking like water and look like off-white dirt. These are dry lake beds. There is an enormous one called Sevier Lake (which contains no water) along US 50. We found a nice place to stay close to a lake bed...I'm not sure it was the Sevier lake bed, which we had already passed, but it was some sort of lake bed. We again went mountain triking, and here is what the lake bed looks like up close. This is where we stayed near the lake bed from a vantage point about a mile away on one of our triking expeditions. You can see that the neighborhood is sparsely occupied. After leaving City of Rocks, we proceeded south into Utah and found a very private spot in the Uinta National Forest south of Vernon, off state highway 36. We again went for trike rides on the unpaved roads. This is about as close to mountain biking as a trike can get due to lack of sufficient traction to actually ride across the countryside. In addition to mountain triking, I also spent a couple of days advancing the RV Facelift project, covering the faded, disheveled and dinged original paint/fiberglass/weird stripey decals with new, drip-laden, amateurish paint in colors a bit more imaginative than the originals. Yes, if you are wondering, the flamingos are also being re-painted. We made our way to CIty of Rocks National Reserve and camped, illegally, as it turns out, near a cattle trough with lots of dried-up poo beside it. We didn’t know we were illegal until the fourth day, when a diffident young ranger showed up (you know you are getting old when the rangers all look like children and inspire such thoughts as, 'isn't he adorable?') and said, “This is park property.” I looked at him interestedly, waiting for him to deliver the punchline, but no punchline came. He simply reiterated that we were camped on park property. After a few moments of staring into his earnest gaze, light began to dawn in my consciousness and I said, “So does that mean we’re not supposed to be here?” It turns out that that is exactly what it meant, but by that time we’d been camped four nights and we were ready to move on. Although we were illegal, we had a lovely time and took three trike rides. I highly recommend City of Rocks. The LEGAL campsites are gorgeous, all scattered amongst the rocks. They cost money, but there was no signage, even at the pay station, to indicate how much. A large number of my photos were so overexposed as to be unsalvageable :( I did get enough properly exposed photos to give you some idea of what the place looks like. The main feature of City of Rocks is....brace yourself.....rocks. I know! Who would've thought? Apparently the settlers coming through in their covered wagons on the California Trail found these rock formations quite ghostly, like an abandoned city. The photos of the most unusual formations were, of course, overexposed. They reminded me a bit of looking down on Yosemite from the back side. After a day in Boise doing exciting things such as laundry, we drove south a few miles looking for the Birds of Prey National Conservation Area. If you are thinking that I stopped to take a photo of Absolutely Nothing, you are quite correct. That is what we found in the Birds of Prey Nat’l Conservation Area…Absolutely Nothing. Actually, I’m exaggerating a bit. We also found thousands of shell casings, broken glass, and various items of a rubbish-y sort. I did not photograph them because you can find similar views at your County Dump if you are interested. Why do people figure the desert is a good place to dump their garbage? I am mystified. Then, the next day, we pottered along for many more miles to discover that there is a road at the bottom of a portion of Hell’s Canyon which dead-ends at the Hell’s Canyon dam. Determined to see the actual canyon and the actual river in the canyon, we drove the 22 miles to the dam, and this is what we saw. It is difficult to capture the massiveness of these cliffs looming over the canyon, but I’ve given it my best shot. That night, weary from our endless driving, we stayed beside this creek. After an entire day of climbing straight up, and straight down, and straight up again, we reached the Hell’s Canyon Overlook. 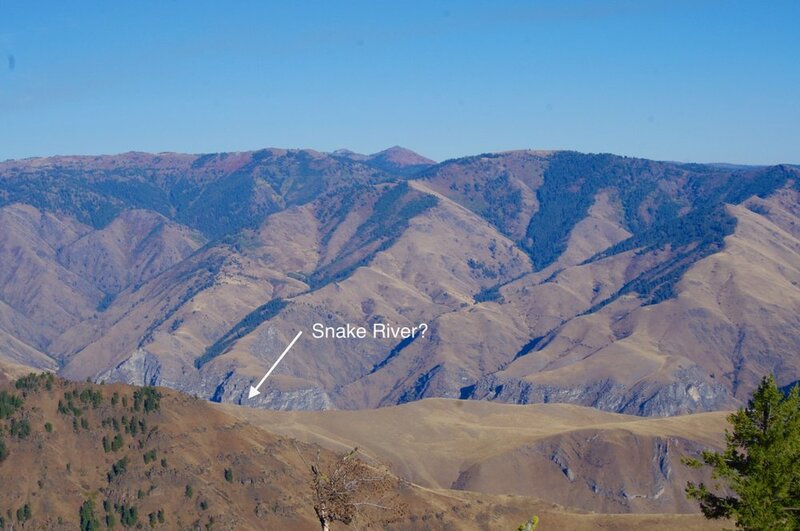 Here is the view from Hell’s Canyon Overlook…do you see the Snake River 7,000 feet below us at the bottom of the deepest gorge in North America? Neither do I. I’m not exactly sure what we are ‘overlooking’ here, but I guess this is as close to an overlook as you get. We did see some swoopy limestone ridges though. We departed from Sandpoint, ID on October 3rd. In addition to my two large dogs, I am now traveling with 3 cats as well. I really didn’t think the hair situation could get any worse, but I was wrong. 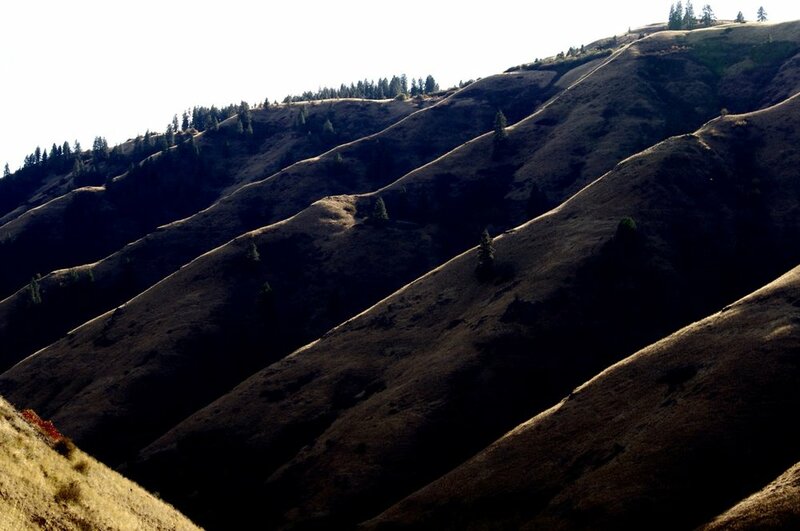 We were on our way to Boise and decided to take the scenic route through Oregon to see Hell’s Canyon. It took us a few days to accomplish this because the roads are so mountainous that we averaged maybe 25 MPH. Here is the area we were traveling through. Because we couldn’t camp at White Sands, we had to find another spot. This spot turned out to be the Three Rivers Petroglyph site, where there are over 20,000 petroglyphs. I’ve seen plenty of petroglyphs in my travels across the southwest, but these were the absolute best. The variety (and sheer quantity) was amazing. I’ve never seen a petroglyph of a human face before this, and some of the animals were pretty great, too. There were many more photos I wanted to include, but enough is enough…go see them yourselves; it is well worth the visit. Of course I injured myself clambering among the rocks to see the petroglyphs, partially because I had not properly equipped myself with a cane, and partially because a pair of sandals with actual straps to keep them on my feet (as opposed to the more usual flip-flops) is about as close as I can come to hiking boots. A pair of ankles with the strength and stability of half-cooked pasta did not help matters, either. I was congratulating myself on my persistence and willingness (as a handicapped person) to overcome any obstacle in the pursuit of seeing cool stuff, so I stifled my cries of agony and superciliously brushed off the injuries as being of no importance. Then the next day, as I was hobbling down the road trying to walk the dogs with a wrenched knee and some sort of weird (but very painful) abrasion on the bottom of my foot, I felt very whiny and put-upon. So much for my persistence. This probably isn't the best one to start out with, but it was one of the first ones I saw, and it reminded me of a pooping angel. Maybe the angel is pooping lightning bolts? Anyway, I was very fond of it for that reason, and included it even though it isn't one of the clearer petroglyphs. Much later on the trail I found another pooping angel but this one has a growth of some kind on its wing that might be a dog? The naturalism of this ram's head is different from the more highly stylized petroglyphs I've seen before. Here's a whole sheep...again, I thought this was unusually naturalistic. So most of you probably aren't impressed with this petroglyph, but my family members will immediately recognize it as Leopold the See-Through Crumb Picker. Leopold the See-Through Crumb Picker was one of the many books our mom read to us when we were little. I thought he was an original idea, but here he is in a 900 year old petroglyph. Wow! This is obviously a cross between a giraffe and a turkey. And this, also obviously, is some sort of pterodactyl/road-runner thing. I don't know what this is...some kind of scrawny horse, maybe? But what I love about it is that it seems to be playing yo-yo with its tongue, and the yo-yo is the Earth. So it must be a cosmic beast of some kind that has a yo-yo earth tongue. Here is a man with garden rakes for arms and bell-bottom pants. And here is a googly-eyed monster. And here is an even more terrifying monster with halloween teeth. Lastly, we have a man with a Mayan pyramid on his head. There were several others I wanted to post, including a fish and a bunny and what looks like an Urban Planning layout, but I thought you might be getting bored, so I will cease posting for today. After leaving the Gila NF, we tried unsuccessfully to find our way into the Organ Mountains-Desert Peaks National Monument. This is a huge NM in three separate pieces clustered around Las Cruces. We were seeking access to the portion that is immediately southwest of Hatch, NM. 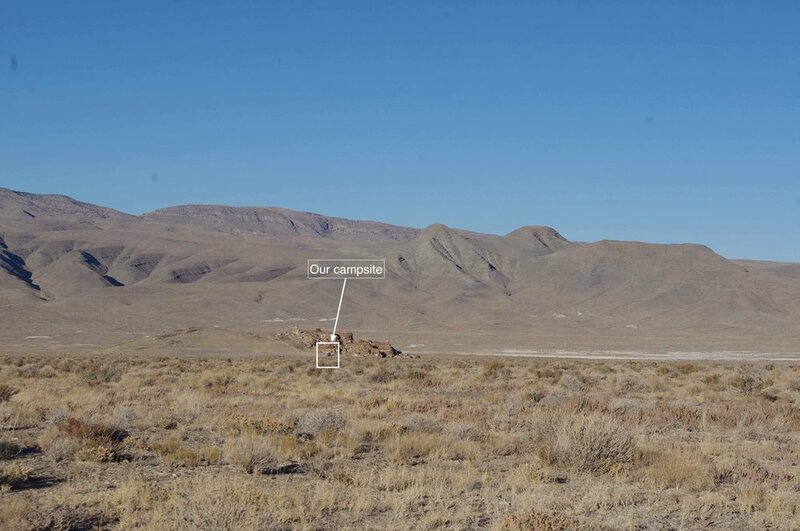 Information subsequently obtained from the BLM indicates that there actually are access roads into the monument, but I could not locate any of them, as none are on my roadmap. In fact, even though the BLM says there are numerous access roads, their map doesn’t show any, either, nor does it give any directions for finding them. And there's not a sign to be seen on the highway, either. Is this another tissue of lies foisted onto the American Public by the national government? And why would they do such a thing? Alien burial ground? Nuclear wasteland? Oh wait. They don't hide those; they build picnic sites over them. Ultimately, I blame my Associate Navigator for my failure to find my way into the monument. I’m really beginning to question his competence. However, since I signed him up for the job without his consent, I guess I am getting my just deserts. I should have known he was lying about his qualifications. After we gave up on Organ Mtns/Desert Peaks, we headed for White Sands Nat’l Monument, which hangs off the White Sands Missile Range like a half-forgotten appendage. We wanted to camp there…my son and I stayed there many years ago (like 30), so I thought we could. However, we were informed at the gate that there was a ‘test’ of some sort the next day, so no one could stay in the monument that night. I assume the military was planning to bomb it into oblivion, in which case these photos are among the last surviving records of what it used to look like. There were several miles of road through the monument on which we were not allowed to stop (a ‘safety zone’) so I had to shoot a bunch of pix from my moving vehicle. This made us very unpopular with the other tourists, as it necessitated moving at a slow pace. It also resulted in a lot of useless photos of my exterior rear view mirror. In case you are wondering, the sand in White Sands is truly white. Apparently it comprises the largest collection of gypsum dunes in the world (or possibly some other impressive area such as the western hemisphere…I forget). Anyway, the gypsum dunes are plopped down on top of other, normal desert soil sort of like whipped topping on a pie, so it’s quite interesting to drive along on the brownish soil and suddenly see these snow-white dunes looming over the road. This is called the 'inter-dunal' area, where there are many patches of regular desert amongst the dunes, and more plant growth on the dunes themselves. As you continue down the road, you reach the 'heart of the dunes', which is all dune with less vegetation. The sand was soft, like beach sand, and it looked a lot like snow in the areas without vegetation. The dunes are always moving because the wind blows the gypsum around. The sand actually did sparkle like crystalline snow. Although this is a poor photo, you can kinda see sparkles here and there. 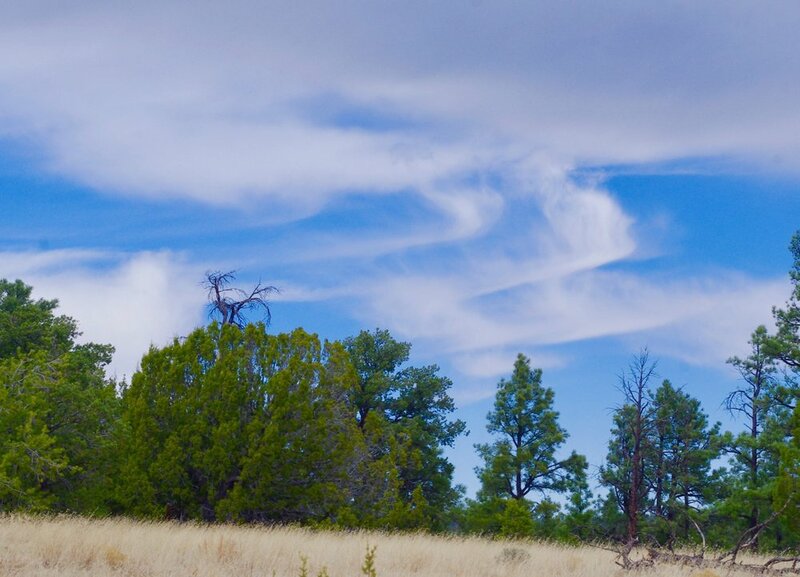 As you leave the Gila Cliff Dwellings NM, you find yourself back in the Gila NF. We actually stayed in more than one spot in the Gila NF, and this is the nicest one. It’s FREE!!!! MY kind of campground!!! Of course, it has no amenities, including garbage service, but who cares? Pack it out. The whole area is just beautiful, and for some strange reason we had the whole campground to ourselves on Friday night. On Saturday, a couple of other misbegotten souls joined us, but they seemed intent on enjoying the silence and the view just like us, so they were no bother. This is the view from our campsite looking at the opposite side of the gorge, across the river (which no doubt carved out these cliffs). And here is the river, itself. One can walk down to it (or drive, actually, but we walked). These pictures were taken just as the sun was about to rise over the cliff, so the angles at which I could photograph were severely limited...somehow, taking pictures of the sun results in white photos. Go figure. We were in NM by this time, camping (well, living, really…you can’t call what we do ‘camping’) in the NF northeast of Silver City. So before we left the area, we drove up NM 15 to see Gila Cliff Dwellings National Monument. NM 15 is basically hairpin turn after hairpin turn. Much of the time, I was in first gear doing 15-20 MPH, so it takes a long time to drive to the monument. It’s worth it, though, and I highly recommend seeing it. 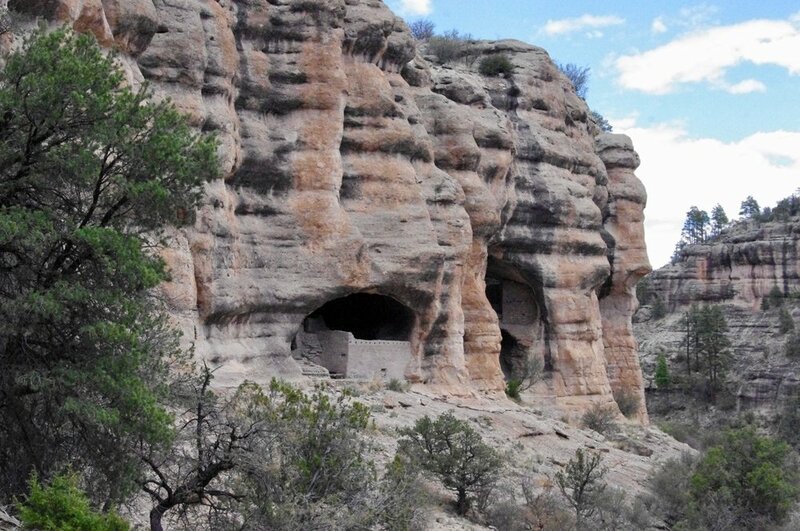 After paying a modest fee of $5, you can hike a mere half-mile up to the caves where these dwellings were built. They let you walk right through the caves and see the ruins close-up, which is educational. As a tourist, I love things that are educational. This is the little creek flowing at the bottom of the gorge which the cliff dwellings overlook, and you cross it many times on the trail up to the caves. As you see, the photo is still grainy...I had not discovered my ISO setting yet, and so, spoiled all the pictures of Gila Cliff Dwellings NM as well as the Chiricahua ones. In case you have temporarily lost your mind and think that these lovely stairs disappearing into the gloom of the cave might have been used by its ancient residents, no, they are a modern addition by the Dept. of the Interior to enable us tourists to climb up into the ruins. I didn't take any photos inside the caves because the lighting was poor and I had no outboard flash...I figured none of them would come out anyway. This, however, is the view that the residents had from their dwellings.